As the moon trundles around its orbit, we find her passing through Leo for February’s full moon tonight (3 February). This means that we shall find ourselves acquainted with the energies of that most magnetic of the Tarot court personalities, the King of Wands. Someone who is working their King of Wands energy is someone whose inner life and outer life are as one – there is no conflict between what’s going on in his head and heart and what he is called to do. And, by Jingo – they are called to be active in the world! His appearance in your life encourages you to take action in those matters that you feel passionately about. And you don’t take action in a small, quiet way – my goodness no! The King of Wands is someone that you can see for miles off! Let people see you walking your talk with confidence and enthusiasm! This character likes people to look at him! He’s fond of nice things and doesn’t mind showing them off. That could make him a royal pain in the arse, but fortunately his show-off gene is accompanied by a generous gene too – so if you hang around with King of Wands people, there’s a good chance that you will benefit from their largesse! King of Wands people are very good at seeing the Big Picture in a situation. They seem to be able to rise above the fray and see all the horizons with clarity. 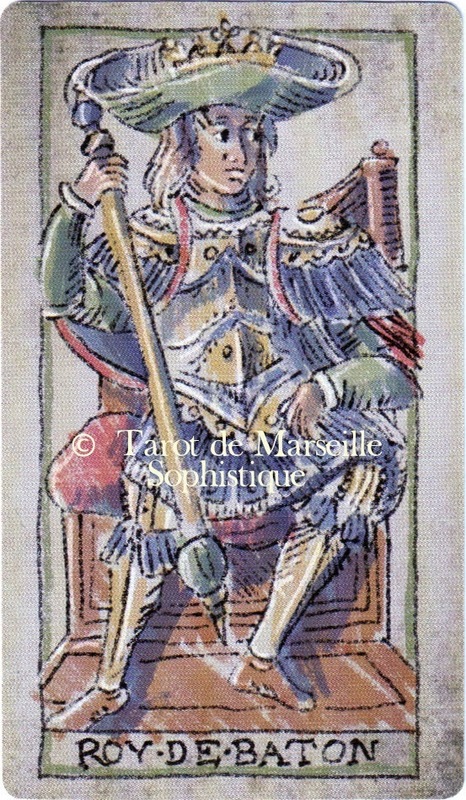 All the Wands Courts are forwards-looking energies and this King from the Kickstarter-funded Marseille Sophistique is pictured looking off to the right. For me, the right is the direction of the future. It’s a good time, says the King of Wands, to take action and get moving towards your bright and beautiful future! 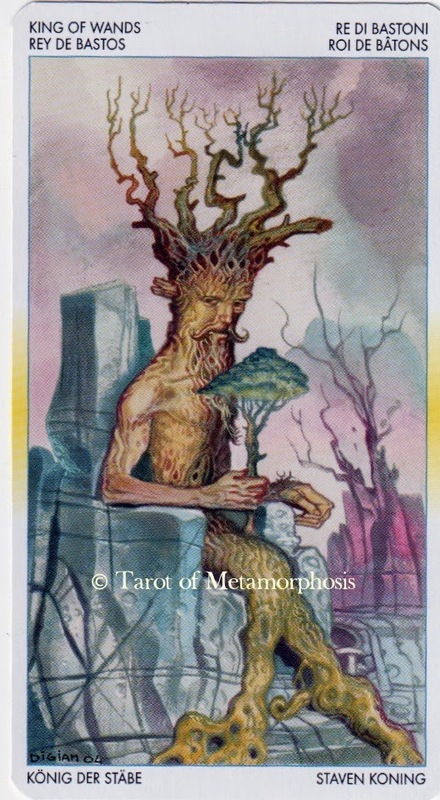 Here in the King of Wands from the Tarot of Metamorphosis, we see clearly how he is associated with the strength and growth. There are smokey grey and pink clouds behind this King – makes me think that there is a forest fire somewhere! That reinfoces the idea that when this King catches fire, you can see the results from quite a distance! What do you feel passionately about? What BOLD steps can you take today that move you towards that passion? Are there any confusing situations that can be grasped with more clarity right now? The King of Wands says: It’s time to look forward with confidence!